Jean exclaimed when he looked at the instrument that measures the Carbon dioxide. It was unusually high at 3.2, way above the normal of 1.2. This meant that we would not be able to stay too long, but having got here, there was no way I was going to be hurried as I might never see anything as magnificent again in my whole life. I stood and stared at the wonders before me through Jean’s new binoculars. The Lions, Rhinoceros, Horses and Bison leapt at me from the wall. What a sight! The paintings are truly magnificent. I turned to look at the Sorcerer crouching over the great black female pubic triangle. What potency, what power and what a setting. On the wall behind the Sorcerer was the giant Bison. What an animal! I wondered about the Bison’s saddle and the black belted rhinoceros. Where these markings examples of artists licence? I can’t believe they were. I have seen Belted Galloway cattle in England and have been told how extremely strong that the particular gene is. Could the woolly rhinos have had black belts? 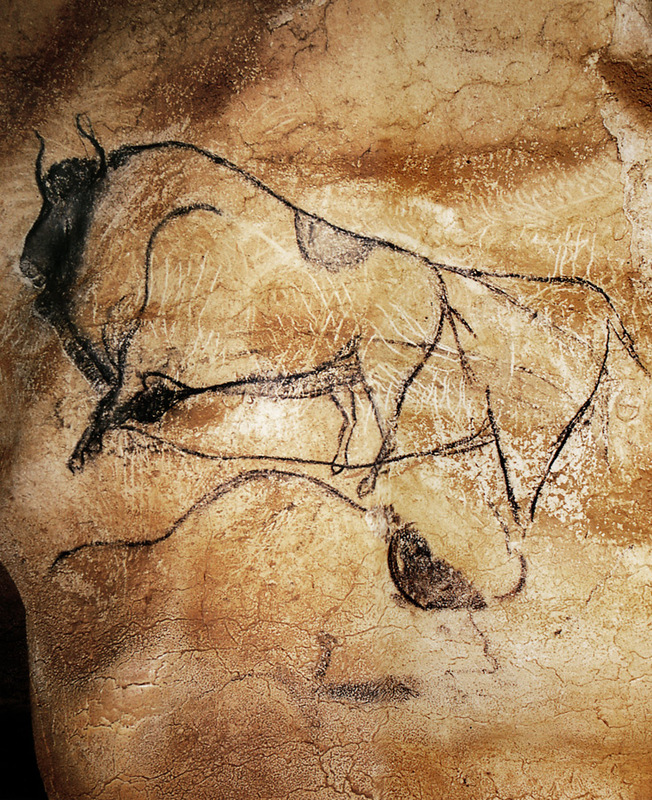 Personally I think it is possible, as the Chauvet animals are very realistic and the artists didn’t make things up when drawing them. I was being to feel as though a band was being tightened around my head. My breathing had become laboured and I was experiencing a slight pain in my chest. It was time to leave. We started back up the steel walkway and stopped at the level just below the entrance to examine the remains of the five fires. The golf ball chunks of charcoal looked as though they had been burnt only yesterday. The fires were probably lit at this level and not lower down near the Sorcerer, because they would not have burnt there with the lack of oxygen. The artists must have had to work incredibly quickly in the dim light as they breathed the foul air. It was well past lunchtime but I asked to see the bear paintings on the way out. We made our way across to the side cave were the paintings are located. I lay down on the steel trolley, pulled myself in along the tracks fixed to the floor and looked up at the red outline of the two bears. 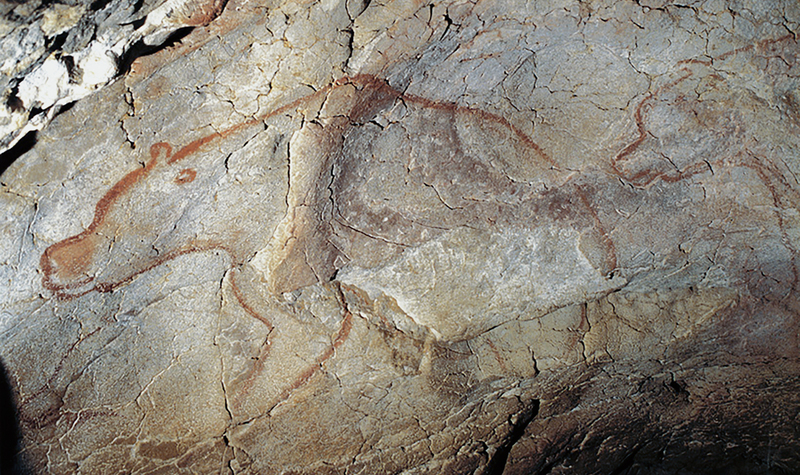 They are not only perfect line drawings, the artist has also used the natural contours on the surface of the rock to aid his composition, so they have become a relief. 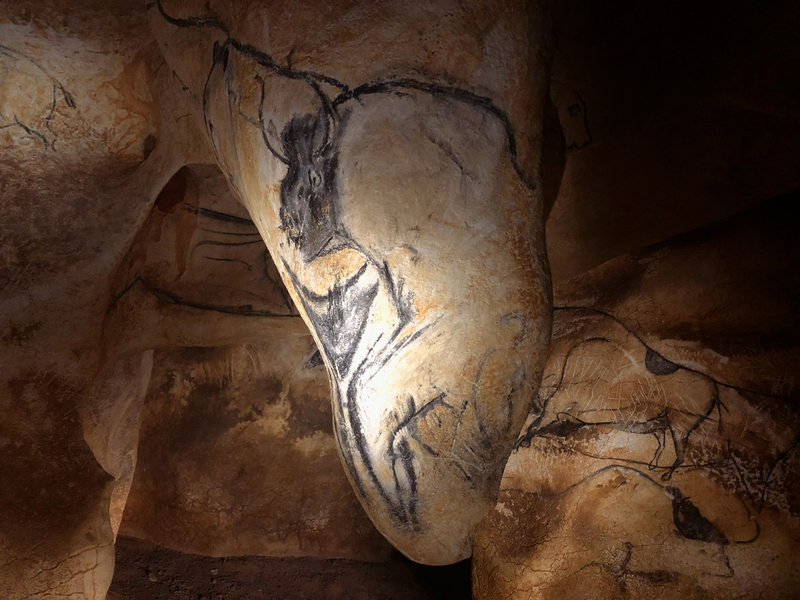 It is a sure yardstick of real art if a painting gets better every time you see it and the art of Chauvet passes this test with flying colours. I pulled myself out and climbed up the ladder back out into the sunlight, completely humbled. For me Cro Magnon is the greatest miracle of evolution. Apart from the possibility that if the dinosaurs hadn’t disappeared, mammals would not have had the space to explode into, If there were a re-run of Evolution, the chances are Homo Sapiens would not be here either. To be really bizarre, what if things had happened the other way around and placenta mammals had developed in Australia and marsupial in Africa? There would probably have been no monkeys to develop into Homo Sapiens. No tigers or kangaroos crossed the Wallace Line to reach Australia or Asia. The first mammals to cross the Wallace Line were the Barrinean people. We know this because they reached Tasmania before the island was cut off by the rising sea levels following the last Ice Age. 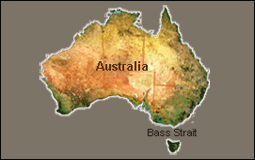 The Aborigines that lived in South Australia and Victoria never crossed the Bass Straits, which in effect was another Wallace Line, but this time for Humans. 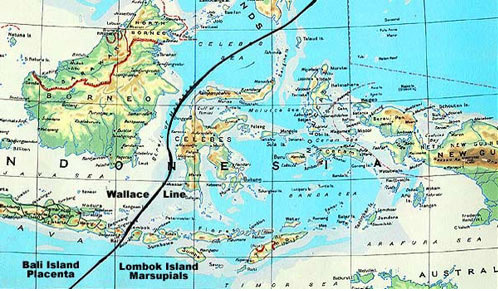 The Barrineans paddled across the sea that separated the islands of Bali and Lombok, then walked all the way to Tasmania. The scientists have accepted the date of their arrival in Australia to be about 60,000 years ago. George Chaloupka told me that the next mammal to cross the Wallace Line to Australia was man’s pet, the Dingo Dog, around 5000 years ago. Many Dingos escaped of course, causing unbelievable damage to the natural fauna of Australia, but most returned by boat with their masters to Asia, taking with them the marsupial’s tick, which adapted very quickly to living off the blood of their new placenta breeder hosts in Asia. There is another possibility though, perhaps the Barrinean people brought the Asian tick to Australia when they arrived 60,000 years ago? 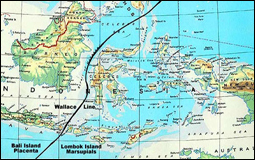 The interesting thing to me about the 60,000 year ago date for the settlement of Australia is that it happened only 12,000 years after the massive eruption of the Mt Toba super volcano on the island of Sumatra. According to Professor Stanley Ambrose, the Greenland ice core scientists confirm that this eruption took place 71,000 years ago. Ambrose states that the Mount Toba eruption was the largest that has possibly ever happened on the Earth and produced so much Sulphur Gas, it caused a six-year long winter.